The PORTABLE ROPE is a high stepper. Rope height adjusts from 4" to 16". Sturdy pipe frame made from galvanized steel. Rugged polypropylene rope is spliced into a series of running squares. Safety features include bungee cord suspension system, rubber end caps, and clear running lanes. Sets up in minutes. Use it in the field house or out on the field. 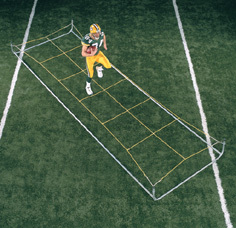 Conditions your athletes while developing agility, coordination and high knee action. Rope matrix available in two sizes: 12 squares or 16 squares. Frame measures 19' long by 5' wide. "The coaching point is to exaggerate form running mechanics to build a more powerful and fluid stride!"